To purchase an article, please email: LTA.Service@thomsonreuters.com or contact us on 1300 304 195 (Australian customers) or +61 2 8587 7980 (international customers) during business hours (Mon-Fri, 8am-6pm AEST). This article argues that the current state of Australian corporate law is sufficient to sustain an action against the directors of a company which violates human rights in offshore operations and supply chains. It outlines the “black letter law” found in the Corporations Act 2001 (Cth) and case law, considering recent judicial authority on corporate social responsibility and reputation which creates the potential for the imposition of liability for human rights violations. It examines the enlightened self-interest and “stepping stones” approaches to the interpretation of directors’ duties. It analyses the impact of soft law principles, changing community expectations and the “self-regulation penumbra” on the interpretation and development of directors’ duties. 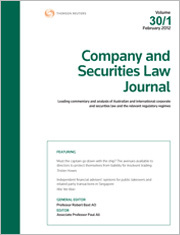 Finally, it considers the potential for enforcement for a breach in this context, either through an action brought by ASIC or by private litigation undertaken by shareholders, and the impact of litigation funding arrangements and class actions on the corporate risk calculus for directors operating in this environment. This article is based on a paper which was awarded the 2017 Baxt Prize by the Business Law Section of the Law Council of Australia. This article examines life insurance claims handling in Australia in light of ASIC’s Report No 498 (Life Insurance Claims Report), a report produced in the wake of media coverage relating to the claims handling conduct of CommInsure. This article analyses the current regulation of life insurance claims, and considers recent developments which are designed to improve the level of consumer protection. It analyses the Corporations Act licensing and product disclosure regimes. It then outlines the duty of utmost good faith, concluding that although the duty applies to claims handling, the regime for enforcing compliance with the duty is inadequate. Finally, it considers the provisions of the Life Insurance Code of Practice (Life Code) relevant to life insurance claims handling. For the PDF version of the table of contents, click here: Westlaw AU – CSLJ Vol 36 No 2 Contents or here: Checkpoint – CSLJ Vol 36 No 2 Contents.